Some of the most notable gains for women in this year’s election will come from black women. 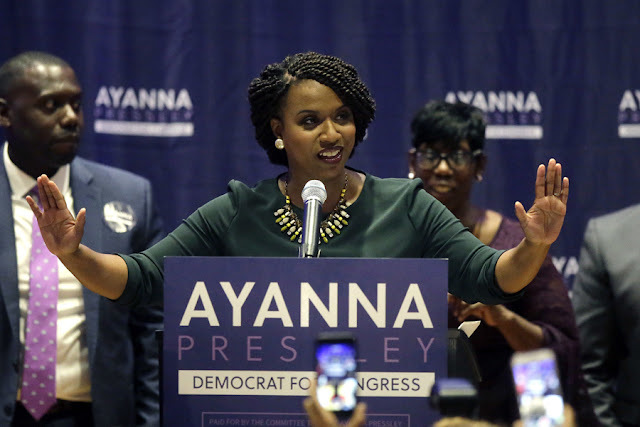 All three non-incumbent black women candidates favored to win on Election Day—Jahana Hayes (D-Conn.), Ilhan Omar (D-Minn.), and Ayanna Pressley (D-Mass. )—will be not only the first black women, but the first women of color, to represent their states in Congress. Omar will break another barrier in joining Rashida Tlaib as the first Muslim congresswomen, and Pressley’s win against a 10-term incumbent reflects how political success is not constrained to those who wait their turn. Pressley’s victory, and the anticipated wins of Hayes and Omar, demonstrate another thing: the electoral viability of black women in political contexts where they are too often counted out. For Pressley, the doubts among political and party insiders have been great, meaning the investment in her primary candidacy was minimal to zero among those typically perceived as key influencers in U.S. elections. Jahana Hayes won the Democratic primary in Connecticut despite running without her party’s endorsement. Hayes and Omar also won nominations in majority-white districts, an important counter to those who have doubted the ability of black women to be successful outside of majority-minority districts or states. But Black women’s political success did not just begin this year. Six of the seven Black women currently serving as mayors of the top 100 most populous cities in the United States have been sworn in since Election Day 2016. And while women’s and black men’s state legislative representation has plateaued in recent decades, black women have seen a steady—albeit slow—increase in representation in state legislatures nationwide. In Congress, while gains for women have been slow and incremental, the racial and ethnic diversity among women, particularly Democratic women, has grown in the past decade. In fact, nine of the 14 new women elected to the 115th Congress (2017-2019) were women of color. Political scientist Wendy Smooth puts these successes for black women into context, writing, “African-American women appear to be overrepresented in elective office while simultaneously holding the characteristics that would make them least likely to be politically engaged,” such as lower levels of income and educational access. This “paradox of participation,” as she terms it, is also notable when the under-investment in black women as candidates is taken into account. What’s more, research from the Center for American Women and Politics survey of state legislators found that black women officeholders were more likely than their white counterparts to report being discouraged from running for office in the first place.